Caird came to prominence in 1888 when The Westminster Review printed her article entitled Marriage. The piece analyzed the indignities historically suffered by women in marriage. Referring to the present state of marriage as a “vexatious failure”, Caird advocated the autonomy of, and equality between, marriage partners. Her polemic drew a speedy response from The Daily Telegraph in the form of a popular series called Is Marriage a Failure? Motivated by a sense that her views had been misunderstood, Caird refined her argument in Ideal Marriage later that same year. In 1897, The Morality of Marriage and Other Essays on the Status and Destiny of Women collected together Caird’s numerous essays on marriage and women’s issues in a single volume. 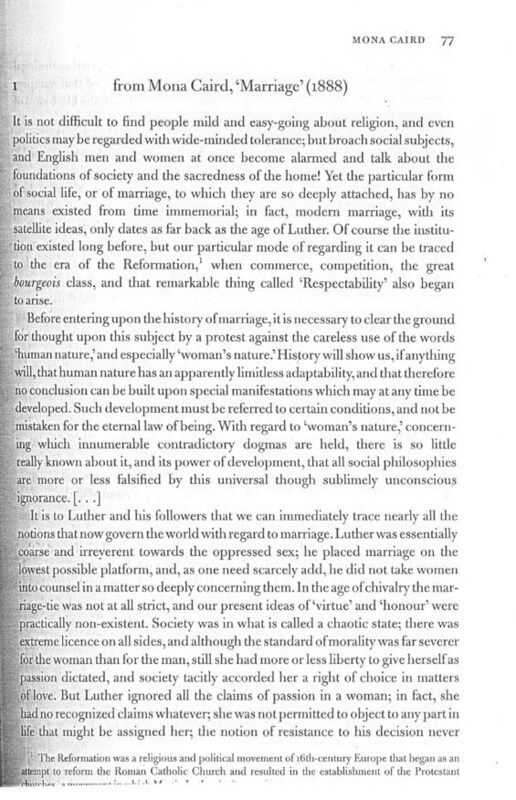 Below is extract from Mona Caird’s essay ‘Marriage’ (1888) taken from S. Ledger and L. Luckhurst (eds), The Fin de Siecle: A Reader in Cultural History, c. 1880-1900 (Oxford, 2000).